My field service business is too small to need to track my engineers. We can't afford to track our engineers. We don't want our engineers to think we don't trust them. I don't understand why we need to track our engineers. All valid-sounding reasons—but the fact is, if you aren't tracking your engineers you're likely losing income. We'll blast through these excuses to show you why you need to track your engineers—plus how it actually saves you money, and how to implement real-time vehicle tracking without sinking your engineers' trust in you. Most engineers have a strong work ethic—but not 100% of them. No one wants to think that their employees may be stealing from them, but it does happen; we even wrote about a case where an engineer was selling the company's stock online. Smaller businesses are especially at risk since they can't afford to pay as much as the big guys; according to the CPA firm Dannible & McKee, employee theft always starts with some kind of pressure, and that pressure is often financial. For example, an employee's spouse may have lost their job, or maybe they're falling behind on mortgage payments. Dannible & McKee suggest going by the M.O. 'Trust, but verify'. You can trust your engineers, but still implement vehicle tracking to verify that nothing shady is going on. You can't afford not to track your engineers. Think you can't afford to implement real-time GPS tracking? Consider what it costs your business if you don't track your engineers. According to LPM Insider, a 2013 study by Kessler International showed that more than 30 percent of respondents admitted to falsifying the actual time they worked. Let's say your field service business has nine engineers and they work 45 weeks of the year. If these statistics hold true, three of your field service engineers are saying they're working when they're actually not. If each of them takes just two extra hours off per 40-hour workweek and you pay £13 per hour, you're losing £3,510 per year in wasted wages alone. That doesn't account for the opportunity cost of missing out on jobs because those engineers aren't fitting as many jobs into the day as they can. Over 45 working weeks, that adds up to £22,500 in missed opportunities! Your prices and situation may be different, but this rough estimate shows how you can lose over £26,000 from just three of your engineers slacking off a mere two hours per week. Add thousands more in fuel costs onto that if those engineers are using your service vans to do side jobs on the sly. All this means a vehicle tracking system can pay for itself in no time. If you're worried about the price of tracking your engineers, instead of looking at the standalone systems that can cost a bundle, consider field service management software that includes a vehicle tracking feature. You'll pay a lot less, and also save time by having everything integrated into one system. Here's how to break the news to your engineers. As we mentioned, most engineers are working when they're supposed to be working, going where they're supposed to be going, and being upfront and trustworthy about their time use. Yes, 30 percent of employees may be falsifying the time they work—but that means 70 percent are not. Seeming like you're accusing honest employees of time theft is not the best way to retain engineers. Tracking your engineers doesn't have to turn into a trust issue. Here's what to do. Instead of installing vehicle trackers in your vans without telling your engineers, and then coming down hard on them when you detect rough driving or time wastage, let them know upfront that you'll be adding GPS trackers to their vehicles. As we discussed in our post on the big problems you can solve with vehicle tracking systems, there are a lot of reasons to install vehicle trackers that have nothing to do with heading off untrustworthy engineers. Save money on vehicle maintenance costs. Charge the right fees for every job. A more profitable business = higher income for your engineers! Instead of viewing vehicle tracking as a way to catch and punish untrustworthy engineers, use it as an opportunity to improve employee engagement. For example, you might offer incentives to engineers with the most on-time record or the safest driving. In large field service businesses with dozens of employees, no one questions why they need to track their engineers. If you want to grow your business as well, tracking your engineers is considered a smart business decision—not an unnecessary imposition on your employees. 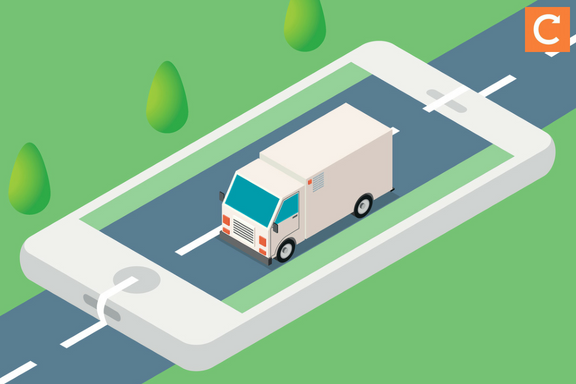 Real-time vehicle tracking is just one of many methods you can use to turn your vans into profit generators. Download our free checklist Are Your Service Vans Driving You to Success? below, and we'll walk you through everything you need to do, from branding your service fleet to protecting the tools in your vans.